8 Bit Weapon on TV! If you haven’t been following me on Facebook, you may have missed that I’ve been posting about a TV Show that I’m going to be on! It’s called Beyond Geek! It’s going to be airing on your local PBS Stations. If you don’t see your area listed where it’s showing, please contact your local PBS station and encourage them to add it to your area! We are on the episode called 8-bit of Fun! Chiptopia: The Best of 8 Bit Weapon & ComputeHer released today!!! Chiptopia covers over a decade of the best groundbreaking work by the chipmusic bands 8 Bit Weapon & ComputeHer. Whether you are new to chiptune or you’re an old school chipper this is a must for any collection! Check it out on the music page and enjoy! The Smithsonian American Art Museum’s “The Art of Video Games” Exhibit will feature music by Computeher and 8 Bit Weapon! 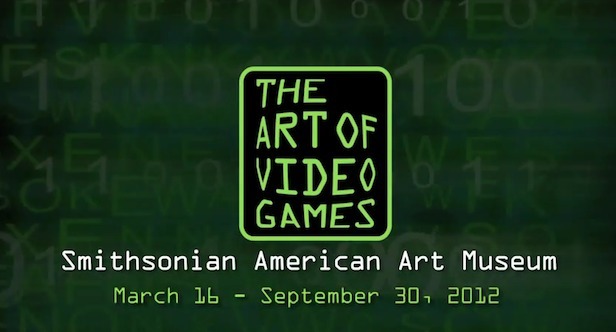 We are proud to announce ComputeHer and 8 Bit Weapon’s music will be featured in the forthcoming “The Art of Video Games” exhibition at the Smithsonian American Art Museum in Washington DC! “The Art of Video Games” will explore the 40-year evolution of video games as an artistic medium. Both ComputeHer and 8 Bit Weapon will have a combined total of 5 songs being used in a soundtrack at the entrance to this historic exhibition. 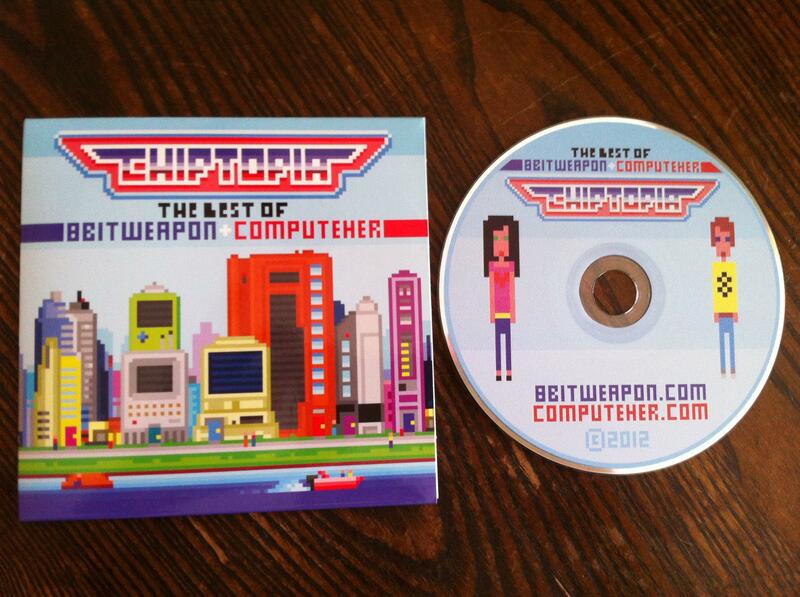 8 Bit Weapon’s songs, “The Art of Video Games Anthem” and “Miami Dub Bounce” off the new album “Bits with Byte” are used as well as “Chip on your Shoulder.” ComputeHer’s songs, “Twilight Byte” and “Dark Pub” from her album “Modemoiselle” are also featured. We are profoundly honored to participate in such an important exhibition. We’d like to thank everyone at the Smithsonian American Art Museum as well as our fans for making this possible. Here is the official “The Art of Video Games” Press Release. Please visit the Smithsonian American Art Museum’s website for information about “The Art of Video Games” exhibition. ComputeHer and 8 Bit Weapon will also be performing live at “The Art of Video Games” exhibit’s “GameFest” opening weekend event March 16-18, 2012! Please see our events/show page for details. My Commodore 64 Goes to the Smithsonian! My Commodore 64 will be on display in the Smithsonian Museum of American Art! I’m truly honored that the exhibit curator, Chris Melessinos, asked to use it. The C64 pictured here will be one of many vintage computers and consoles displayed during the “Art of Video Games” Exhibit coming March 26, 2012! The Disko Apocalypse Tour is Here! The Disko Apocalypse Tour is Here ! 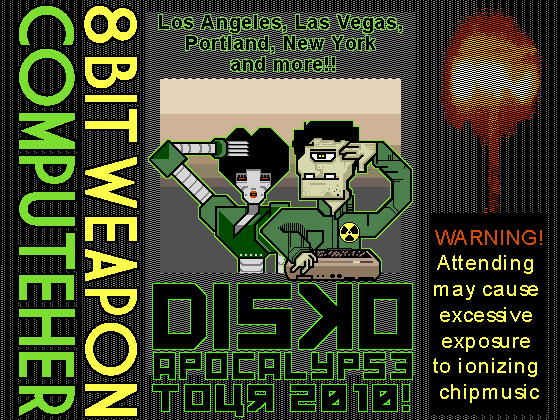 Greetings Programs, we are packing up our favorite chipmusic instruments and heading out for our “Disko Apocalypse Tour” this summer! Come with us as we take our new live show to New York, Las Vegas, Los Angeles, Portland, and more! The tour will be spread out over several months. Official “Disko Apocalypse Tour” dates and locations will be posted here as they are confirmed. We are funding the tour ourselves, but we are about $2000 short. This is where you come in, we need to raise money to cover our remaining tour expenses. We have gigs lined up across the USA and its just a matter of funding to get to each of them. If you donate to the tour, we have great gifts/perks (CD’s, T-Shirts, etc..) to offer in exchange for your generosity. The Holiday CD is Here! 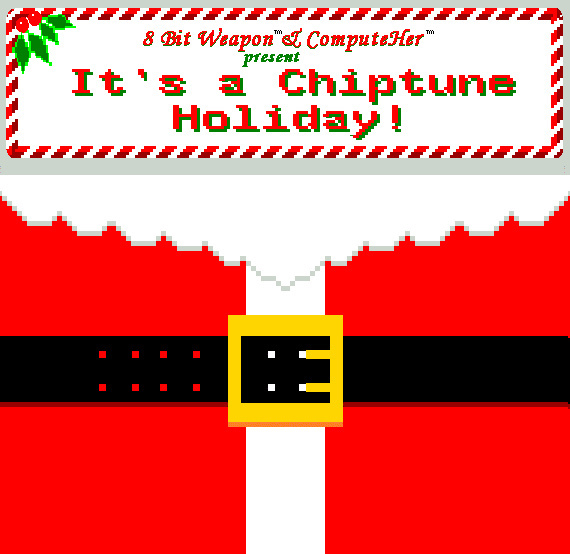 8 Bit Weapon & ComputeHer have whipped up a tasty batch of delicious holiday chiptunes for everyone! Go ahead; sink your aural teeth into some fresh chiptune goodies while you drink up a hot mug of 8 Bit delight on a cold winter’s day. Time tested holiday favorites that everyone can sing along to or entertain with at a holiday festivity! Each collectors CD case is hand crafted out of a rare authentic frosty light grey colored 5.25″ floppy diskette! See store page for further details. The iPhone Apps are here! You can now get your very own official 8 Bit Weapon and ComputeHer iPhone apps on iTunes. Watch and/or listen to exclusive app content, play games, read bulletins, get tour info, and more!